As of Monday morning, July 18, 2016, an NIBIB-funded experiment is nested within the 4,975 pounds of cargo hurtling towards the International Space Station aboard the SpaceX Dragon capsule. The experiment will grow bone cells in the microgravity of space and may help researchers understand the bone loss that is common to bed-ridden patients and to astronauts. 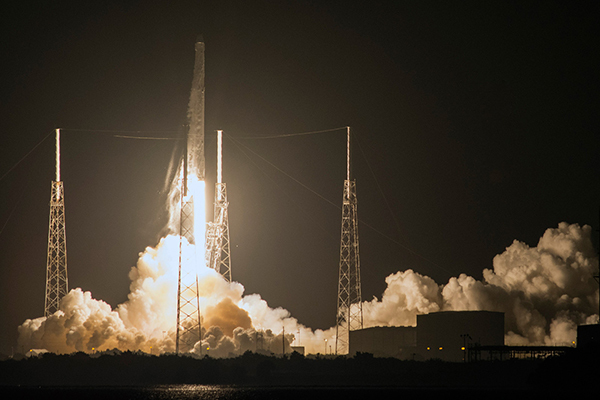 The cargo was successfully launched from Cape Canaveral, Florida, and will meet up with the space station on Wednesday, July 20. [Update: The SpaceX Dragon cargo spacecraft arrived and a robot arm secured it to the International Space Station Wednesday morning.] The experiment is part of a program of collaboration between the NIH and NASA to provide researchers with access to the orbiting science laboratory. University of Minnesota researchers led by Bruce Hammer, Ph.D., professor of radiology, designed the experiment with technical assistance from BioServe Space Technologies. Launch of a Falcon 9 rocket from Cape Canaveral with SpaceX’s ninth operational Dragon resupply capsule en route to the International Space Station. The NIBIB-funded Osteomics experiment is stowed on board. Photo credit: SpaceX. At the same time as they are growing bone cells in space, the researchers will grow similar cells on the ground, but in simulated microgravity within a high magnetic field. The researchers will use the magnetic field to suspend, or levitate, the cells to learn whether terrestrial magnetic levitation conditions generate the same results as microgravity in space. Understanding the response of bone cells to varying levels of gravitational force may help researchers design drugs or physical therapy to reduce bone loss. 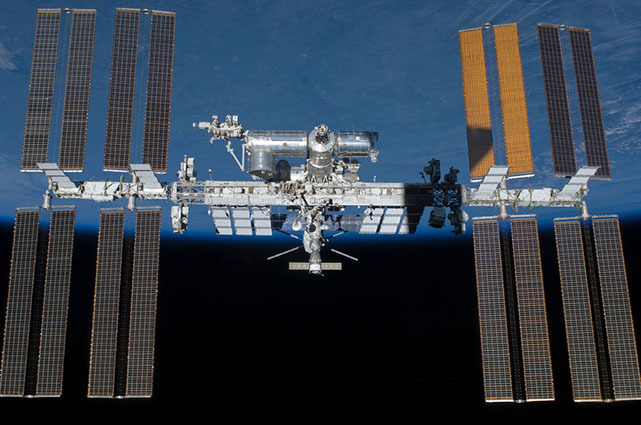 The International Space Station orbits Earth as second home for astronauts who complete an array of scientific experiments. Photo by NASA. The launch of the experiment has been a highly anticipated collaboration between NIH and NASA, the results of which may be used to help the elderly, those confined for long periods in bed, as well as highly conditioned astronauts. The study, dubbed Osteomics, will be retrieved and brought back to Earth for analysis in early 2017. For updates about the missions of the International Space Station, go to https://www.nasa.gov/mission_pages/station/main/index.html.